Works on the biggest investment in history of Adidt are finished. 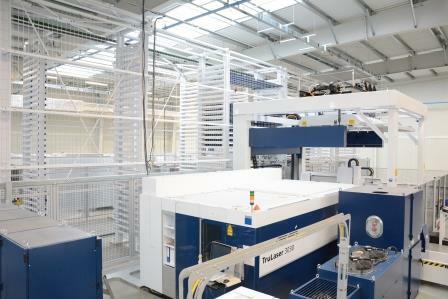 Automated and fully integrated system for cutting and storing the products from Trumpf was put into operation. This investment perfectly fits in realized by Addit Smart Factory concept, which is a part of Industry 4.0 strategy. 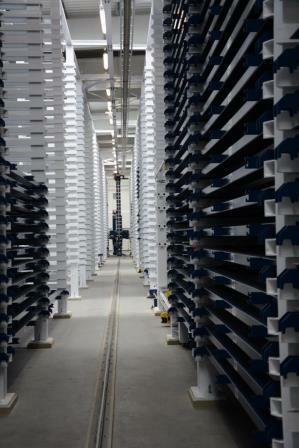 Investment is located in newly built production hall from July 2017 and covers an area of over 4000 m2. 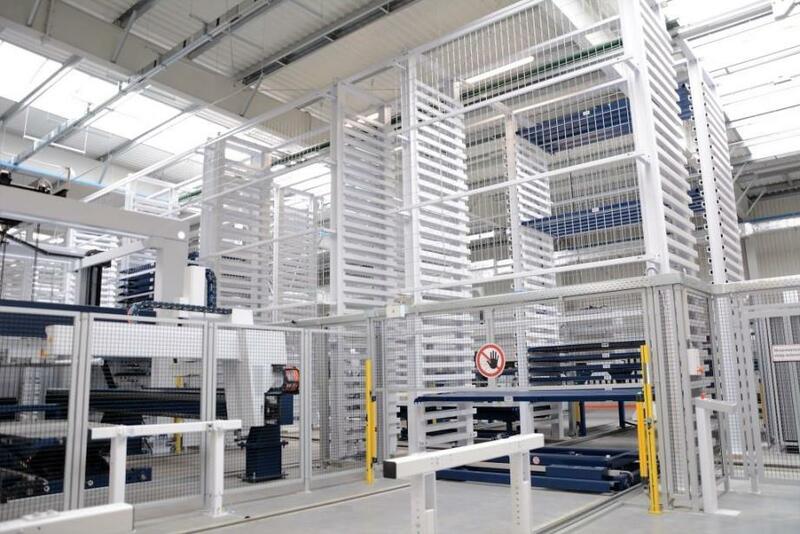 Almost 63 meters long system consists of automated storage from Stopa having possibility of placing there 2 500 europallets automatically connected with cutting machines from Trumpf. Currently there are two laser cutting machines TruLaser 3030 Fiber with automation there, one of them of a power of 6 kW and one combi cutting machine TruMatic 6000-1600 Fiber. In the second stage two more machines will be added: one laser cutting machine and one combi cutting machine. 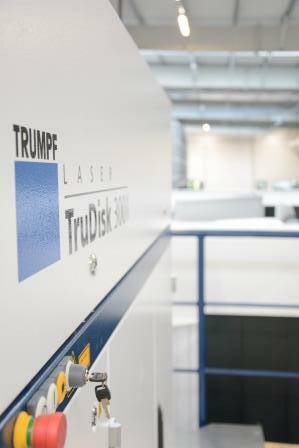 Both TruLaser 3030 machines are equipped with numerous facilities and options. Automatic nozzle changer and automatic nozzle cleaning, ContourLine, Detect Line, Smart Collision Prevention, BrightLine Fiber are only a few of them. 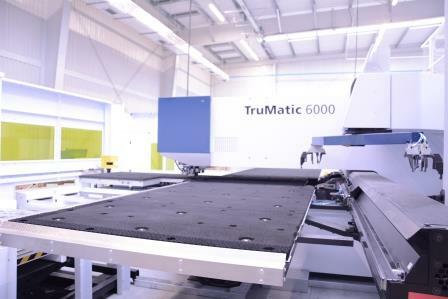 Also combi machine TruMatic 6000 offers wide range of possibilities being equipped with i.a. ToolMaster device enabling automatic set up without stopping the machine, engraving, tools control or automatic recognition of sheet metal deformation. However heart of the project is TruTops software for production management fully integrated with Addit’s ERP system – SAP as well as with Stopa storage. Whole cutting process at Non Ferro Department is currently automated starting with 3D drawing up to releasing of the products. 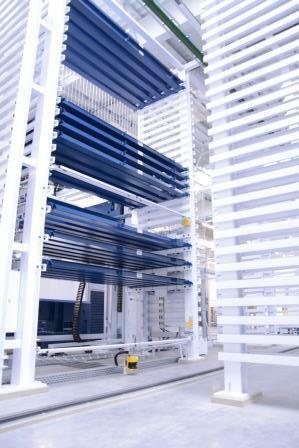 Creating 2D drawings, programming of the machines, feeding the storage with raw material, product’s layout on a sheet of metal, cutting process, supervision over quality of the process, sorting, delivery of cut products to the storage and release of ready products for next processing - all of these are being done automatically. New approach to production implemented at Addit gives many advantages to our partners. Set up costs are fully reduced. It happens so through all functions of process’ parameters control, automatic exchange of tools, automatic adjustment of parameters to type of technology being used and dynamic nesting. Mentioned dynamic nesting allows to eliminate stock of the products, since this operation enables to create a mass production out of a whole bunch of various products. Hence manufacturing cost of one piece is the same as e.g. 100 pieces. Therefore there is no need to increase production lots in order to decline a production cost. Our flexibility in relations to our partner’s needs will be even higher, since the customer has a full freedom of describing product’s quantity in its purchasing order. Additionally there is no need for products’ collection guarantee, which are in the storage, since there are no any with this approach, and with new purchase order our partners can change revision of the product freely. Our newest investment thanks to which we have i.a. made serial production out of small quantities is unique in the global scale. Addit proved once more to be a trendsetter and offers to its partners unparalleled nowhere else solutions contributing to their growth and development.